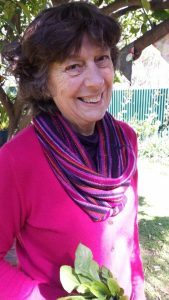 Judy Vizzari interviews Meg Montague, from Northcote. Meg is on the Board of Foodbank Victoria. There’s a black curly haired dog on the verandah – the sort that seems to be blessed with a permanent smile. When she sees me, she’s up and sniffing and, although I’m not the best with dogs, she’s so friendly that I just have to pat her. Her fluffy tail wags. Looks like we’re off to a good start. I’m visiting Dr Meg Montague’s house in Northcote. It’s a little Federation weatherboard tucked away in a leafy side-street. It has the kind of wide verandah that stretches from its classic front entrance across and around the corner of the house. There’s dark green trim on the green painted boards and the home’s lovely cottage garden is contained by a brick and rail fence. 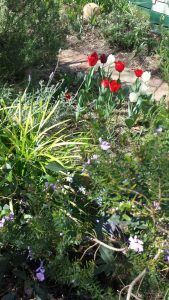 The garden has a theme – purple, green and white – but, as Meg later decries, renegade red tulips have crept in to interrupt the scheme. 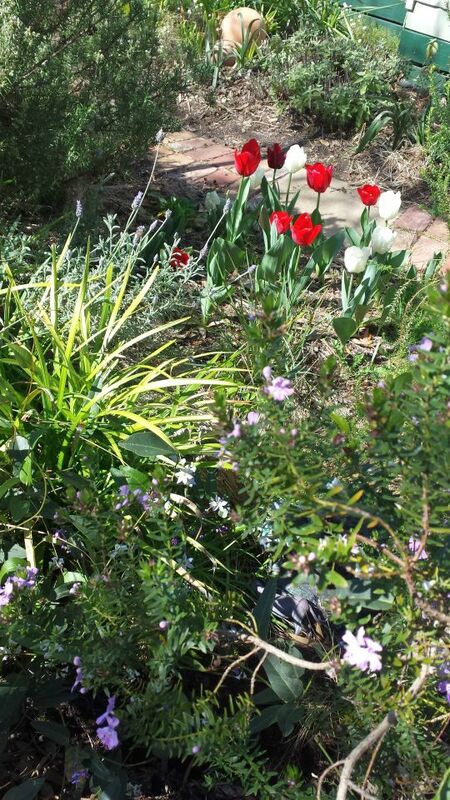 But why worry, the garden is a charming blend of lavender, rosemary, sweet peas and hyacinths. There’s a beautiful wooden horse nestled amongst flowers and herbs and the whole scented garden, with its wandering brick path and handed crafted mosaic stepping stones, sets the mood for all who enter. Meg opens the door and I’m confronted by a slender, dark woman who moves with nervous energy. She seems to be just as friendly and unassuming as her dog, who she introduces as Roodie. She smiles broadly and introduces herself while ushering me into the generous passageway which leads to her back yard. It’s here that we’re going to explore her garden but first, she sketches in her background. Meg tells me that she spent her youth in Manchester, England during the post war era. She remembers how her family’s two allotments and various ducks, geese and chickens provided much of their food. However, she also remembers how the city was so much a victim of coal pollution that resulting ‘pea soup smogs’ prevented children from attending schools and that coal particles in the air affected blackened clothes and faces. 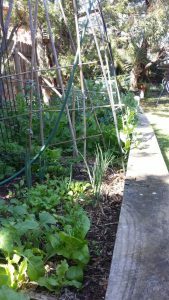 It wasn’t an ideal environment for vegetable gardening – all produce had to be carefully washed prior to consumption – but her experiences did instil in her a life-long love of gardening. 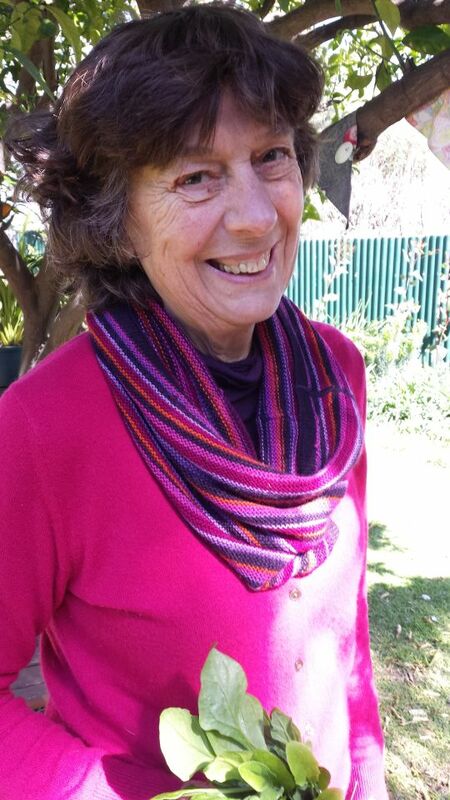 Meg moved to London to study and then, in 1973, she came to live in Queensland, Australia. She describes the change of climate as “a shock“, something she “had to get used to” as the lush growth there provided very different gardening challenges. Five years later, she was on the move again – this time to the rather barren, heavily concreted rose growing suburb of Northcote in Melbourne. It was here that she finally found a place where the weather suited her(!) and, with a little help, would suit all her needs. I’m looking out from the slightly raised verandah onto a generous backyard. It’s dominated by a beautiful orange tree but I can see a collection of fruit and indigenous trees as well as raised garden beds and compost bins. There’s also some comfortable timber furniture which Meg tells me was recycled from others’ discards, a backyard shed and a no longer used basketball ring. This is a pleasant sun-dappled green space which lives up to its dual personality – entertainment area and food bowl. There’s plenty of life here, even a noisy bunch of birds who’ve chosen to rival our conversation. We start with a long, raised bed which runs parallel to the left fence line. In it are a collection of plants which, although Meg strives to grow in an ordered fashion, seem to run and jump to their own beat. The peas are climbing energetically up a bamboo frame and the spinach, the Warragul greens “have gone completely bonkers!” There are broad beans (which are less than successful owing to the pushy spinach and overhanging gum) and the beetroot and carrot seedlings (carrots grown from a gift of 20 year old seeds) are just starting their journey. Parsley and chervil are there too and ‘walking’ onions. It’s a food box replete for a busy kitchen. Moving on we find a collection of compost bins – seven! These have mostly been discarded by less successful gardeners and retrieved by Meg. 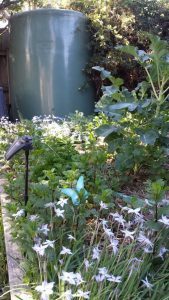 She allocates different fillings to each of the bins – kitchen waste, weeds, green waste sourced from a local food store, diatomaceous earth (a soft rock formed from very ancient, ground-up shellfish), manure, paper and straw from a rabbit hutch are just some of her ingredients. Meg says that she mixes them regularly with a monster metal corkscrew compost turner which she “loves“. I make a mental note to get one. 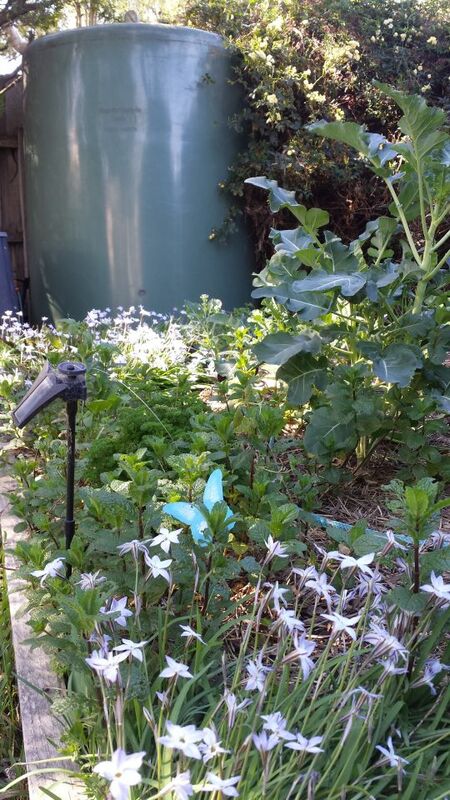 From here we move on to a shared rainwater tank – a pipe leads from the roof of next door’s shed to Meg’s tank and taps on both sides of the fence enable both Meg and her elderly Italian neighbour to benefit from the collected water – real resource sharing! There are two more tanks which also contribute to the health and upkeep of Meg’s plants close to the house. 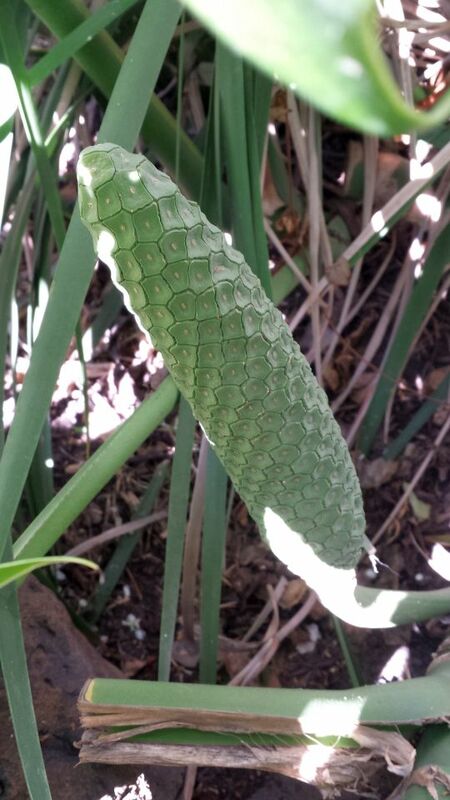 We wander between beds supporting more herbs and vegetables and, en route, I notice capsicums hanging like balls from miniature plants, walls draped with creepers and an amazing monstera deliciosa complete with a fruit shyly hidden behind its giant leaves. 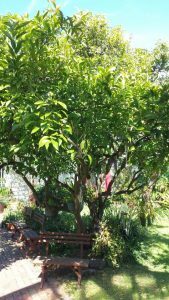 There are orchids and ferns and several other fruit trees. Everywhere is a calm beauty that belies the garden’s practical worth. 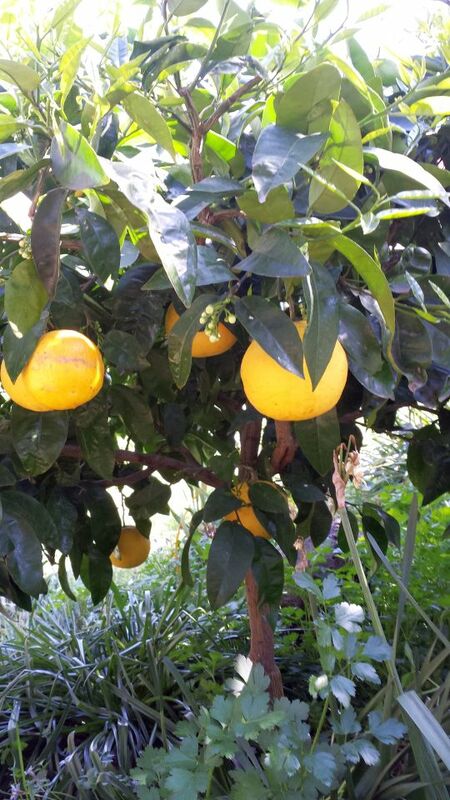 Various citrus trees, including a lemon, a lime, a grapefruit and the aforementioned enormous orange tree, provide fruit and shade. We discuss gall wasps in the citruses and Meg tells me that, whilst there are wasps in her trees, she seeks to control them by cutting the galls out and by discouraging the flush spring growth which wasps nest in. She finds that these methods keep the invaders under control. During our wander, we discuss companion planting, a method which Meg has loosely adopted “but not in a very consistent way“. It seems that this is a garden which is quite comfortable with itself, it has its own rhythm, flourishes in its shared space and has little need for strict regimes. There’s a sense of wellness and calm here. It’s nearly time for Meg to go off to the gym and for me to return to outer suburban Eltham but before I leave I ask her about her link with Foodbank Victoria. The Foodbank sources edible food which would otherwise be discarded and then arranges for it to be distributed to the needy in Victoria by over 500 food relief registered non-profit organisations. They also provide a School Breakfast Program in conjunction with government Education Departments. Also emergency relief to families during drought and bushfires. Foodbank is an Australia-wide organisation and Meg is a member of its Victorian board which, she tells me, is chaired by Ms Dorothy Coombe. We walk back through the house to the front verandah and Roodie returns to her sentry to watch over the house and monitor the street’s passing parade. I thank Meg for her time and for the parcel of Warragul greens seedlings she has prepared for me, then leave her to hurry off to the gym while I return home with the memory of a pleasantly spent morning.